Glug glug glug, that dreaded sound that tends to mean your sink is no longer allowing liquid to flow through the pipes freely as it is now well and truly blocked up, so how can you fix this quickly? Here are a few tips I have picked up over the years. I think most people have a plunger lying around at home for occasions when the sink, bath or shower won’t drain. You need no skills in DIY to do this, so all of us can do this, no problem. Make sure there is no hair or debris blocking the sink hole. Block the overflow with a damp rag or kitchen tissue to allow air to go down the drain rather than escaping out the overflow. With just enough water in the sink to surround the plunger’s surface, plunge up and down rapidly. Do this a few times and then check to see if water flows effortlessly once more. It’s always best to run the taps for a while afterwards to ensure the blockage has dispersed. If you don’t have a plunger, I have been able to do this with the palm of my hand in a cupping position so try that before you go and buy one. Other suggestions I have seen if you don’t have a plunger – cutting the bottom off a 2 litre empty plastic bottle, putting a cloth or sock into a plastic bag or using half a tennis ball. Not sure if these work, but if they do please let us know! No plunger at home and your hand isn’t quite cutting it? Another trick I’ve tried, tested and succeeded with was unravelling an old wire coat-hanger and carefully pushing it down the drain. 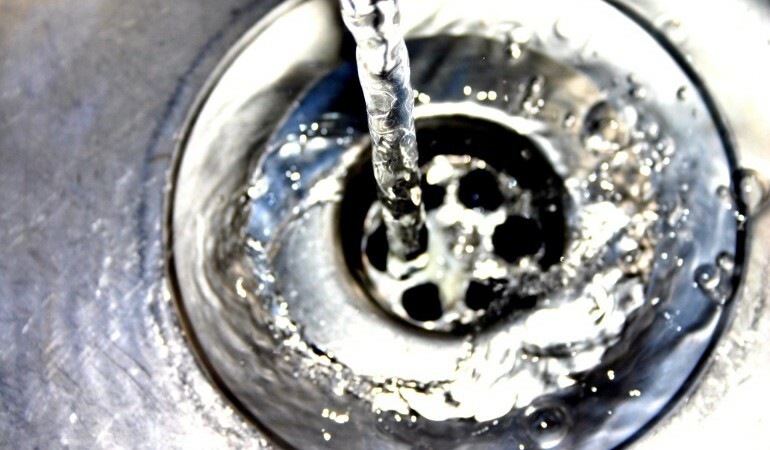 With a bit of water in the sink, manoeuvre it gently down the drain and around the pipes below. Give it a little wiggle and slide it in and out to see if you can shift the blockage. If the water begins to drain away it has worked, so again run some warm water for a minute or so to flush the rubbish away. Drains are commonly blocked by hair, vegetable peelings and grease or fat that has solidified. Try to peel fruit and veg into a bin and pour excess fat or grease into bottles to throw out. If you have to pour it down the drain make sure you run hot water at the same time so it can’t solidify. There’s not a lot you can do about hair in drains except trying to keep the sink hole clean and clear as much as possible…or go for the Bruce Willis look? The Telegraph and numerous other home bloggers have come up with some great ways to remove a drain blockage such as bicarbonate soda and vinegar. Pour a cup full of bicarbonate soda down the drain, followed by the same amount of vinegar and let it fizz for 5-10 minutes. Flush away with a kettle full of boiling water and admire the results. If this method doesn’t work, resort to the ones above! For this one you will need a bucket. Place it under the u-bend underneath your sink. There will be two screw caps, which you need to undo carefully as it is filled with water and potentially gunk. Also be aware of the black rubber seals in this section; do not lose them or you will end up with a soggy cupboard under the sink. Drain all of the excess into the bucket and then have a poke and prod around in the u-bend; probably best to wear rubber gloves for this bit. Once cleared, reattach, not forgetting to put the rubber seals in before you screw the caps on. Check the water is flowing like a river and you are all sorted.